As modern retail practices have evolved, stores have offered refunds for price drops or price discrepancies on purchased items. Previously, you would have had to monitor your purchases and the prices of the items and then ask for the money back yourself when one (or any) of the following happens: you see the price has dropped, you weren’t given the correct sale price or missed out on a coupon. Fear not, online shopping world, there’s an app for that. Enter: Paribus. Paribus is a price monitoring service that refunds users for price drops on recently made online purchases from participating retailers. For example, if you’ve recently made a purchase on Target.com and the price on a particular item drops not long after you made said purchase, Paribus finds that price drop and refunds you the difference. After signing up with your email address, it links to your various online shopping accounts and does its magical work from there. While you continue to shop like normal online, Paribus works on the back-end and finds and scans all incoming receipts on your email for price drops to make sure you receive the lowest price possible – even after you’ve paid for and received your items. When it finds a price discrepancy, Paribus files a claim with the retailer on your behalf, validates your purchase using the info from your account, and requests the retailer refund you the difference. You receive an email from Paribus notifying you of this activity and another from the retailer stating they’ve refunded you the money via whatever account with which you paid. While I haven’t had any recent qualifying purchases, the app provides a “news feed” of sorts that constantly updates with recent price drops they’ve found and “paid out.” For example, in a 30 second time period, Kohls, JCrew, and Target paid out various amounts for clothing and house ware items with a top payout for the day of $74.50 for a Kate Spade handbag from Nordstrom. It simplifies life: Paribus has a lot going for it. With nearly zero effort on your part, it saves you money (and time) while you continue to live your life as normal. It’s very user-friendly: The app’s interface is easy to navigate with its attractive blue and white color scheme and simple icon displays that present the information contained in the app in a straight-forward manner. The sign-up process is simple, maintaining your account and using the app is even easier. It only works with selected retailers: Currently, the app works with only certain retailers. However, the list of participating retailers is extensive and includes big names. The entire list can be found here. It sacrifices privacy: For people concerned with maintaining their privacy, however, Paribus strikes out. Not only are you giving them permission to link up to your various online shopping accounts, you’re also giving them access to your email – and permission to scan it on a regular basis. Additionally, while they contact retailers on your behalf, they contact them as you. While it isn’t a huge issue, some people may find this concerning. 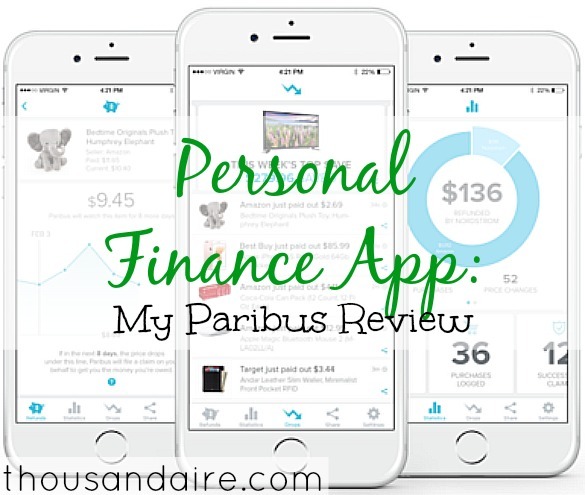 For the frequent online shopper who doesn’t mind sacrificing a bit of privacy for time and money savings, Paribus is an app worth trying. In today’s culture where life often moves faster than anyone would like, Paribus provides just one more way for people to save money without sacrificing their valuable time. For those still concerned with privacy or security issues, but are still interested in the cost-saving feature, there is certainly a risk in using the app and allowing it access to so much personal information. However, for people who shop online, plenty of other online retailers and apps already have this information. Will another one make a difference? If you’re vigilant in monitoring your accounts and do your due diligence in verifying and checking all transactions to ensure there isn’t any funny business going on, the benefits far outweigh the “costs” of using Paribus.